Been there, done that. : IT IS NOT TOO LATE! "Some secrets are like dreams, just waiting in darkness hoping to get into the light." When her father dies Liv finds out about a secret chest that is buried underneath an Ash tree in her garden. Once she discovers how to find and open this chest, her life is changed forever. Liv discovers her father’s secrets which eventually cast her into a world full of dangerous creatures, mighty Norse warriors and perils beyond her belief. Her father’s fairy tales were to become not only her legacy, but a guide line to survival and a map to the world she was about to enter. 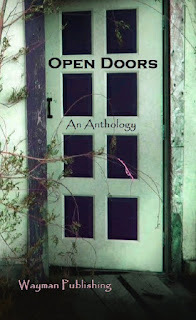 If you would like to download this anthology for free go here to Amazon.com. If you do not have an e reading device, you can also download one for free on Amazon's pages. For this part of the hemisphere autumn has offically arrived. School has started for many and will soon start for others. I would like to wish all the students out there good luck with their studies. Some of you, like my son, may be going back to school as an adult. Whether it is to get that high school diploma, finish college or learn a new skill, it is never too late! If you dream of doing something, it is not too late too try and make that dream come true. It is amazing what you can do if you just don't give up. On another note, this wednesday it is once again time for the Insecure Writers Support Group. This group is all about support and encouragement, not just insecurities and you can always join us. Come back again on wednesday and I will tell you something interesting, as well as give you an update on the death of my nicotine monster. Are you starting school soon or do you have any dreams you want to share? Have you downloaded Open Doors or any other great books this week-end? Working on my blog at the moment for the day. I will mention this again. I was working all weekend. I just tried your download link to get your book. It didn't work. Already downloaded! And my post is ready for Wednesday. Eye Spy more Exciting News! Eye Spy is on the RUN!